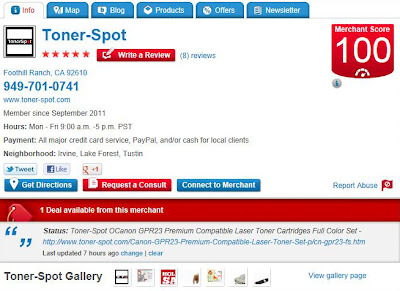 At Toner Spot, we continuously strive to provide excellent service and generate value for our customers. Our definition of value is to provide our customers with the best quality products at the cheapest price. 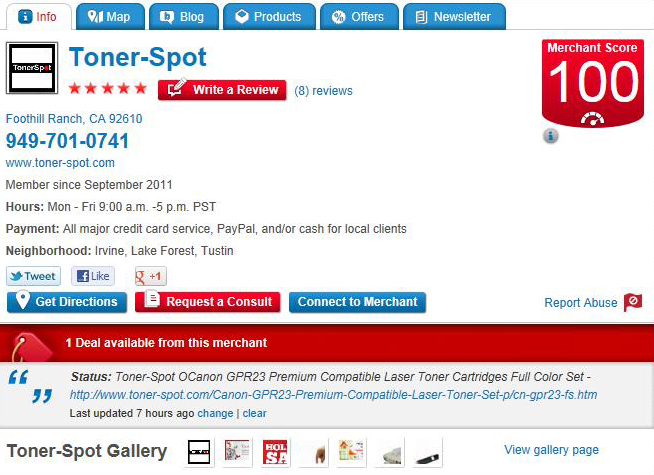 Toner Spot has achieve a perfect score 100 on MerchantCircle.com – the largest social network for local business owners! Providing a place for our customers to acquire quality, affordable, and reliable compatible or reconditioned toner and office supplies has always be the key to our business. We would like to thank you for your continuous support and for your recognitions for our services. As a token of our appreciation, we have also launched a special discount program for non-profits organizations and educational institutions. Contact us at sales@toner-spot.com for details and our customer service representative will follow up within 24 business hours. You’ll be amazed how much you can save on office printing supplies!